I'd like to take this opportunity to remind the safety community of the incredible research potential that will be provided by the Strategic Highway Research Program's (SHRP2) efforts to compile the largest, most comprehensive naturalistic driving study (NDS) ever. Initiated several years back, the SHRP2 NDS collects data on trips taken by over 3,000 volunteers whose vehicles are instrumented to record vehicle location, forward radar, video of the forward roadway, and the driver's face and hands. This information will be coupled with data provided by the vehicle itself, such as braking, speed, acceleration rate, brake, gear position, seat belt use, and air bag deployment. When the data collection is complete at the end of 2013, the database will include information on more than 5 million trips, 30 million travel miles, and 1 million driving hours. This database will be linked by GIS to a Roadway Information Database (RID) that will cover the routes most frequently driven by the NDS drivers and covers a broad array of urban and rural roadways. This data includes roadway inventory information such as number of lanes and their width, grade, cross slope, horizontal curvature, and MUTCD signs, in addition to crash histories, traffic volumes and patterns, weather, roadway improvements, work zones, safety laws, and enforcement campaigns. These linked databases will provide a fuller understanding of how drivers interact with and adapt to their vehicles, traffic, and driving environment. Through the SHRP2 effort, analysis support capacity is being created so these enormous databases (over 4 petabytes of data) can be accessed in more manageable sizes to address particular research questions. The opportunity and the challenge for us all—public, private, and academic researchers—is to capitalize and take full advantage of this phenomenal investment in highway safety when the data is available in early 2015. I encourage you to begin thinking about how these databases could be used to create the next generation of safety countermeasures; think about the full spectrum of a research idea all the way to an operationalized countermeasure—it could be driver training programs, modifications to design guides, vehicle design enhancements, or infrastructure improvements—the possibilities are as broad as your imagination. Anyone who has ever performed a Road Safety Audit (RSA) or taken RSA training, knows instinctively that there are a variety of benefits in using this unique safety assessment tool. While the benefits of RSAs are substantial, they have not been quantitatively measured on a national scale until now. 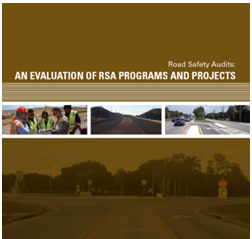 The new publication, Road Safety Audits: An Evaluation of RSA Programs and Projects, quantifies the benefits of RSAs at both the program and project level. The RSA programs evaluated for the publication are summarized in the table below along with their key factors for success. The study also evaluated improvements implemented as a result of five specific RSAs. These evaluations quantified the safety effectiveness of the suggested improvements in reducing crashes. This consisted of a before-after analysis to measure the benefits derived from crash reduction versus the cost of conducting the RSA and implementing the improvement. The five locations exhibited an overall reduction in crashes ranging from 10 percent to 50 percent as a result of the improvements implemented from the RSAs. In addition, the study determined that the benefits of these safety treatments exceeded the total RSA and implementation costs combined. The publication provides detailed information on the statistical evaluation methods used for the evaluation of each RSA as well as a summary of the safety improvements implemented and their benefit/cost ratios. The RSA programs and RSAs evaluated provide State, local, Federal, and tribal agencies with examples and quantifiable results that can help in implementing RSAs and further their growth and success. Regardless of whether an RSA is performed during the design stage or existing stage, when compared to the cost of automotive crashes, improvements implemented from an RSA are cost effective. Contact Becky Crowe at Rebecca.Crowe@dot.gov for more information about the RSA evaluation project, or to obtain a copy of the publication. Missouri had a problem. In a State where nearly 100,000 of the total 130,000 centerline miles are on local or county systems, nearly three quarters of all fatalities in 2005 were occurring on the roughly 33,000 miles of state roads. The first question the DOT had to ask was "why?" "If conditions are ripe and consistent across that system, you need to be proactive and approach the problem from a systematic viewpoint." Fortunately, Missouri has a very robust crash data system that incorporates data on crashes on both state and non-state roads as well as road features at the crash site. This enabled MoDOT staff to sift through the data elements to try to find common denominators that might lead them to a solution. They quickly determined that lane departure crashes, which in Missouri include crossing centerline crashes as well as run off road right and left, were the primary cause of nearly half the roadway fatalities Missouri experienced on its state system each year. Having so much data available also made it possible for the DOT to identify the most common contributing factors, one of which turned out to be cross-median crashes, with the state experiencing about 45 to 50 cross-median fatalities per year. After considering its options, Missouri determined that median guard cable was the best solution not only because it had been used successfully before in several locations in the state, but also because it was a lower cost option than both guard rail and concrete barrier with much lower potential for vehicle redirects back into traffic after initial impact. But clearly the state couldn't install median guard cable on all of its divided roadways, so the state again turned to its crash data. It quickly determined the highest need roadways and prioritized the system. Early on the agency learned an important lesson: crashes were occurring in the gaps between sections of guard cable, so MoDOT decided to pursue a systemic approach and applied the treatment on over 690 miles of roadway. As a result, by 2011, cross-median crashes were virtually eliminated in Missouri. MoDOT quickly determined that only about 5,600 miles of the system experienced a majority of fatalities (just over 50 percent in 2005), so those were the segments that the agency focused on. They adopted an approach centered around the simple concept of "keep people in their lanes," and turned to low-cost, high-value solutions like adding 6-inch rumble stripes on roadway edges and centerlines to improve nighttime visibility, installing larger signs with fluorescent sheeting to increase visibility by day and night, and installing emergency reference markers on divided roadways every 2/10 mi. so that, if a driver does go off the road, emergency responders can reach the scene more quickly. As a result of these and other efforts focused on improving driver behavior (for example, wearing safety belts and not texting while driving) and treating other high crash location types, the 518 fatalities Missouri experienced in 2005 on the 5,600 miles of roads decreased strikingly, down to 265 just 4 years later. But MoDOT hasn't forgotten about the nearly 100,000 miles of county roadways where a quarter of the state's fatalities were occurring. Again, the agency turned to its crash data, which has shown that nearly half of these local roadway fatalities occur within only 5 counties, and nearly 70 percent occur within 14 counties. While it continues to work to identify these counties' prevalent crash problems and the best strategies to combat them, MoDOT is now focusing on developing "County Highway Safety Plans" for each of the 14 counties. MoDOT will use these plans to help local agencies apply the crash reduction strategies it has identified in an effort to drive down fatalities on local roadways. In an effort to dramatically improve crash data collection, analysis, and management statewide, Connecticut DOT (ConnDOT) partnered with the University of Connecticut (UConn) to establish the Connecticut Transportation Safety Research Center. Development of the center marks a significant milestone in ConnDOT's complete overhaul of its crash data program, which began just 18 months earlier when the agency sought FHWA assistance to evaluate its system. 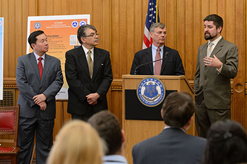 Eric Jackson, right, assistant research professor and director of the Connecticut Transportation Safety Research Center, speaks at the press conference. From left are UConn Provost Mun Choi, Kazem Kazerounian, interim dean of engineering, and James P. Redeker, commissioner of the Connecticut Department of Transportation. (Peter Morenus/UConn Photo). FHWA's Crash Data Improvement Program (CDIP) offers States a comprehensive, onsite assessment of their data programs and provides metrics that can be used to measure the quality of crash data in terms of timeliness, accuracy, and completeness; consistency among reports submitted by different agencies; ability to integrate crash data with other safety databases; and data accessibility by end users. "State DOTs are often only familiar with their own systems because there are few opportunities to view how other agencies approach similar issues. Having access to an outside expert who was knowledgeable about the effectiveness of different crash databases, and could evaluate our system against national benchmarks, was extremely valuable," said Thomas Maziarz, ConnDOT's Planning and Policy Bureau Chief. Maziarz said the CDIP was instrumental in encouraging the agency to completely revamp its data program. "While we had a long-standing relationship with UConn," said Maziarz. "We never considered the full scope of the partnership until we discussed the successful collaboration between the Louisiana Department of Transportation and Development (LADOTD) and Louisiana State University (LSU) at the CDIP review." Once ConnDOT conceived a model for how its new university–DOT partnership would work, it wanted to validate that the approach would efficiently and effectively serve the DOT's needs. ConnDOT applied to FHWA's Roadway Safety Professional Capacity Building (RSPCB) Program to seek assistance in organizing and facilitating a peer workshop so that ConnDOT could explore the LADOTD–LSU relationship further. FHWA's RSPCB Program offers a range of professional development resources to help safety experts advance their skills and knowledge. The program includes access to noteworthy practices, communities of practice, industry training, and customized peer exchange opportunities, all targeted at helping agencies develop and implement effective programs that reduce fatalities and injuries on public roads. In March 2012, ConnDOT sent four employees to tour the LSU crash data facility and to discuss contracting vehicles, IT issues, data access considerations, and other best practices gleaned from LADOTD-LSU's 12-year partnership. FHWA's RSPCB Program helped ConnDOT maximize the peer experience by using video conferencing to engage approximately 15 people from its home offices in relevant sections of the workshop. "The peer workshop did two things: it enabled us to validate the university–DOT data management model we were considering, and it accelerated the process," said Maziarz. Another State DOT with a strong interest in developing a university data partnership also participated in the workshop. ConnDOT's new data repository provides easy access to an array of crash information, including the number of crashes in a town by location, date, street, injury type, and collision type. It also links to other criminal justice databases to support prosecution of traffic violations and to public health databases to measure the medical outcomes and costs of injuries. Several community-based agencies are already benefiting from access to the data, and the repository has recently been nominated for the "White House Champions of Change: Transportation Technology Solutions for the 21st Century" honor. Like many States, ConnDOT aims to transition from paper-based crash reports to a uniform electronic report that is aligned with statewide standards for data entry, submission, and transfer. ConnDOT currently receives about 5,000 crash reports per month; only 35 percent are submitted electronically. Graduate students working in the UConn center, and using a special optical scanning technique programmed by UConn, have already significantly reduced ConnDOT's 14-month backlog of paper reports. While students enter the data, they also gain insight into how the electronic crash form should be developed and the crash database improved. ConnDOT plans to have a uniform electronic crash report submission process in place statewide by January 2015, and will begin prototyping a system later this year. To learn more about the Office of Safety's CDIP, visit http://safety.fhwa.dot.gov/cdip. To request a peer workshop or seek technical assistance in data management or other roadway safety-related issues, visit FHWA's Roadway Safety Professional Capacity Building Program website (http://rspcb.safety.fhwa.dot.gov). A soon to be released study provides the most compelling evidence yet that wider edge lines on rural two-lane highways are a cost-effective, statistically-sound approach to reducing run-off-the-road crashes and fatalities. Overall, the findings demonstrated that wider edge lines on rural two-lane highways can reduce non-winter, non-intersection / non-interchange run-off-the-road crashes by 15 to 30 percent. In the past, many States adopted wider edge lines (six-inch instead of four-inch) for a variety of reasons but adoption has been slow and uncoordinated without sound empirical findings to support the policy change. 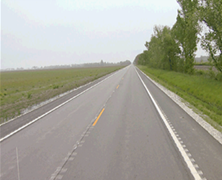 The recent study sponsored by the Federal Highway Administration (FHWA) included data from three States (Michigan, Kansas, and Illinois) and provides information that agencies can use to make sound decisions about the use of wider edge lines. "In Michigan DOT, the wider edge lines were originally installed as a system-wide effort to address elderly mobility." Mark Bott, State Traffic Engineer. "We are pleased that our investment addresses all drivers with the shown reduction in crashes." The study included rural two-lane highways as well as multilane highways. Different statistical analyses were employed for each State because of the different methods each State used to implement their wider edge lines. An Empirical Bayes before-after analysis was used with the Kansas data, an interrupted time series analysis was used with the Michigan data, and a cross-sectional analysis was used with the Illinois data. Although it is well known that causation is hard to establish based on observational studies, results from the three extensive statistical analyses all led to the same findings: wider edge line pavement markings on two-lane rural highways lead to lower crash frequencies and reduced severity. Findings from these analyses, however, do not support the use of wider edge line pavement markings for multilane highways. Wider edge lines are an effective countermeasure in their own right and can also be considered in combination with other countermeasures such as rumble strips. Ongoing research at TTI is starting to identify how wider edge lines and rumble strips mitigate different crash types. While rumble strips address crashes where the driver is distracted, drowsy, or inattentive and can be effective even when obscured by snow or rain, wider edge line seem to be most effective where the driver is looking at the roadway/striping, or where the driver's peripheral vision is picking up the marking. FHWA hopes that in the future, States with different types of terrain will initiate studies to determine if the same crash reduction factors apply. The FHWA Final Report is being processed for publication but the findings and implications are now available in the form of a peer-reviewed paper (see: http://www.sciencedirect.com/science/article/pii/S0001457512000486) and a follow-up report (see: http://tti.tamu.edu/publications/catalog/record/?id=37820). The New Jersey Local Technical Assistance Program (NJ LTAP) developed and hosted a one-day symposium on March 21, 2013, to address pedestrian safety issues. Designing for Pedestrians: An Engineering Symposium was held on the campus of Rutgers University and was attended by 183 people representing local and State agencies, engineering firms, and metropolitan planning organizations. This event was made possible through funding provided by the FHWA Office of Safety's Accelerating Safety Activities Program (ASAP). The agenda was developed to address some of the challenges faced by New Jersey, which is an FHWA-designated pedestrian focus state. The program began with a keynote address by a representative from FHWA's Office of Safety. This presentation provided the foundation for the rest of the day's discussions about identifying problem locations and implementing appropriate counter-measures. Presentations were made in the same transitional order as problem location, planning, and design would: the first topic addressed was crash data, how to access data, and how to use data. The next topic discussed pedestrian road safety audits as a tool to evaluate problem locations; this was followed by a discussion on potential funding sources for pedestrian safety improvements. After attendees were introduced to the ways and means of determining their problem locations and potential solutions, the agenda addressed technical aspects of engineering countermeasures. Three speakers covered different aspects of signalized intersections, including ADA compliance and adaptive signal control. The next group of speakers addressed unsignalized crosswalks and methods of increasing safety, such as hybrid beacons and sign enhancements. The program recapped with further review of low-cost safety enhancements and a review of proven safety countermeasures and resources available from the FHWA Office of Safety. The final presentation was a case study example of a very urban city where many low-cost countermeasures have been successfully implemented, including curb bump outs and pavement marking enhancements. This event met the project objectives of improving participants' understanding of pedestrian safety issues and methods of remediating common problems. FHWA set out to provide information that encourages implementation of countermeasures, and the presentations both addressed many attain-able safety enhancements and provided real-life examples from local areas. Attendees received guidance about crash data and its use, including a real-time demonstration of a crash data search and mini-analysis. Attendees also had the opportunity to ask questions of the speakers, and many stayed afterward to ask additional questions. Speakers explained road diets, hybrid beacons, and medians and pedestrian crossing islands and provided actual local examples. Participants who filled out evaluation forms for this event indicated that the three topic areas they found most useful were signalized intersections, Plan4Safety crash software, and unsignalized crosswalks. A recent study conducted by the Oregon Transportation and Research Education Consortium (OTREC) investigated the effects of Flashing Yellow Arrows (FYA) on pedestrian safety, finding that the signals may have a negative impact. In Oregon, the FYA has been used to indicate the permissive left-turn condition for about 10 years. A flashing yellow arrow indicates that left turns are permitted, but drivers must first yield to oncoming traffic and pedestrians before proceeding cautiously through the left turn movement. The flashing yellow arrow does not replace the solid yellow arrow and its meaning; in some signal head configurations, it may replace the circular green indication as a signal for a yielding left turn. At present, 10 States use variations on this type of signal. Prior to conducting the research, a set of influential operational situations were identified as a focus: the number of pedestrians and their direction of travel relative to the left-turning driver, the volume of opposing vehicles, and the type of signal head (a three- or four-section head). The research used a simulator-based approach with models based on actual intersections in Oregon, with locations for modeling being selected based on historical crash data. Study participants were exposed to simulated independent left-turn movements during which driver gaze information (location and duration) was recorded. Additional simulator data were collected on vehicle trajectory and lateral position; physical intersection characteristics such as number of opposing lanes, angle of skew, and presence of a median; and dynamic attributes such as varying volumes of opposing vehicular and pedestrian traffic. Compared to the case with minimal pedestrian activity, as the number of pedestrians in-creased, drivers focused more of their attention on crossing pedestrians. As the number of opposing vehicles increased, drivers spent less time fixating on pedestrians. Between 4 and 7 percent of drivers did not focus on pedestrians in the crosswalk at all. There did not appear to be a difference between any variable and the presence of a three- or four-section head. In terms of practice, the results suggest that it may be desirable to limit permissive operations when pedestrians are present, and that the additional cost of four-section heads may not be justified. Researchers suggest that at some intersections, the safety gained by running the pedestrian phase separately from the FYA phase may offset any loss of vehicle throughput efficiency. To improve pedestrian safety further, this approach could be combined with a leading pedestrian interval. To read the entire report, which is available without a fee after registering, visit http://otrec.us/project/484. Evaluation is critical to any safety planning process and the Strategic Highway Safety Plan (SHSP) is no exception. By conducting evaluations, States can determine the progress and impact of their SHSP, enabling them to recognize their successes, uncover challenges, and identify opportunities for improvement. The SHSP process is ongoing and cyclical, which is why it is important to assess how the SHSP is managed, developed, and implemented on a regular basis. It is also necessary to examine the SHSP's performance and identify whether goals and objectives are being met; a fact recognized in the new transportation law, Moving Ahead for Progress in the 21st Century (MAP-21). MAP-21 requires States to evaluate and update their SHSP regularly, so the SHSP Evaluation Process Model (EPM) could not have arrived at a better time. To help States meet their SHSP evaluation needs, the Federal Highway Administration (FHWA) developed and recently released the EPM. The EPM helps States answer basic questions of evaluation, such as: What are we trying to do? How well are we doing it? How can we improve? Assess their SHSP management process: Is the SHSP managed in such a way to support effective development, implementation, and evaluation? For example, what is the organizational structure that supports the SHSP? How is coordination achieved? How is data used to identify needs and strategies? How are other agency plans and priorities aligned with the SHSP? Determine progress in meeting their SHSP performance measures: To what extent have strategies and actions been implemented (outputs), and to what degree are goals and objectives being met (outcomes)? Focus on results: How will results be interpreted and used to improve the SHSP process and performance? But before a State even begins the evaluation, it needs to establish evaluation objectives (e.g., what SHSP issues or questions need to be addressed), determine what data is needed to address the objectives, as well as determine who will be responsible for the evaluation effort and how the results will be used. The EPM walks States through those steps as well. To help States apply or "operationalize" the EPM, recommended actions and checklists or self-assessment questions are provided in each chapter. The appendix contains chapter-specific worksheets, which are intended to encourage a deeper review of the self-assessment questions. Equipped with this information, SHSP managers can more effectively administer their SHSP process, determine their State's roadway safety needs, and chart the course ahead. The primary audience for the EPM is the State Department of Transportation (DOT) or lead agency responsible for the SHSP. SHSP leaders, program managers, transportation safety planners, and other traffic safety professionals will all benefit from the information in the EPM. The EPM is located at: http://safety.fhwa.dot.gov/hsip/shsp/. The FHWA Office of Safety is available to provide workshop or conference presentations, webinars, and technical assistance to support a State's SHSP evaluation efforts or use of the EPM. For more information, please contact Jennifer Warren at (202) 366-2157 or Jennifer.warren@dot.gov. The Office of Safety would like to congratulate Sue Groth, a Minnesota Department of Transportation (MnDOT) State Traffic Engineer, who on May 8 was named one of 12 Champions of Change in the Transportation Technology Solutions for the 21st Century category. The Champions of Change program is a White House initiative designed to highlight individuals, businesses, and organizations whose extraordinary stories and accomplishments positively impact our communities. The individuals or organizations receiving the award were selected for having provided exemplary leadership in developing or implementing transportation technology solutions to enhance performance, reduce congestion, improve safety and facilitate communication across the transportation industry at the local, State or national level. Ms. Groth and the MnDOT Office of Traffic, Safety and Technology (OTST) were selected for the agency's work to reduce fatal and life-changing crashes on Minnesota roadways while enhancing mobility for all users. OTST is being honored for designing, testing, and helping to deploy dozens of life-saving rural intersection conflict warning systems throughout Minnesota while leading a national effort to do more of the same throughout rural America. These systems save lives at rural intersections that might otherwise not warrant more traditional traffic control devices or geometric improvements. A 3-day workshop recently conducted by the Lone Star Local Technical Assistance Program (LTAP) Center at Texas A&M Engineering Extension Service helped a group of traffic signal technicians for small urban areas improve their understanding of signalized intersection safety and the importance of properly maintaining signal systems on urban roads. Funded by the FHWA Office of Safety's Accelerating Safety Activities Program (ASAP), this workshop trained staff from five Texas municipalities, including some with virtually no signal experience, in the basics of operating and maintaining their signal system in a way that maximizes safety. When a municipality's population exceeds 50,000 in Texas, it must assume responsibility for the traffic signals on State routes within the city. In most cases, this becomes the city's entry into traffic signal operation and maintenance. Because it is rare for cities of this size—or even somewhat larger—to have a qualified traffic engineer on staff, technicians are largely left to their own devices for dealing with the new challenge. The focus of this effort was to assist three such localities (staff from five localities were actually trained) and to determine the best way to extend that help to others. The training used a workshop format with a small group. As a result, it was possible for instructors to assess the knowledge and experience of participants and then to tailor the discussion-based presentation to fit the trainees' needs. The work-shops resulted in very interactive, open discussions, partly due to the small group size—a total of 14 people, 12 from the three selected municipalities and two who were invited as guests of one of the selected localities, attended the training. Trainee feedback on the experience was universally positive. The workshop introduced participants to helpful new technologies, improved their ability to address their own problems, and increased their awareness of the critical importance of their work to traffic safety. It also helped them recognize their need for more training, and, perhaps most importantly, it increased their awareness of their own limitations. In several ways, it helped some personnel know what not do without getting help from more experienced technicians first. Anecdotal though they are, findings among the three cities tend to support the idea that smaller cities in Texas desperately need, and want, more traffic signal training than has been available during recent years. It highlights the thin edge existing every day, every minute, between routine operations and serious crashes in many smaller cities across the State. This spring, TXDOT brought online an advance warning system for work zones. This combines an end-of-queue warning system with temporary rumble strips—the first such installation in Texas. Each day, between 55,000 and 115,000 vehicles travel the Central Texas stretch of I-35 where the system will be deployed, with 25 to 35 percent of that traffic being trucks. In recent months there have been several fatalities at construction zones on I-35, some involving 18-wheelers. The advance warning system is being implemented as part of the 96-mile Central Texas I-35 expansion project that will widen the highway from four to six lanes and change two-way frontage roads into one-way lanes. The rumble strips selected for deployment are 13 inches wide, stretch 11 feet across, and are 3/4 inch high. Built for high-speed traffic and made from an engineered resin, each strip comprises three sections that are interconnected to prevent separation. 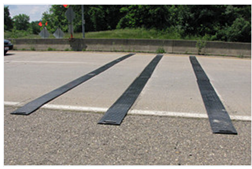 The strips are placed to alert travelers well in advance of a nighttime lane closure, creating a subtle "bump-bump" feeling for drivers as their vehicles roll over a series of three hard-rubber strips. Soon afterward, drivers encounter the first portable changeable message sign (PCMS), which gives them details about the closure ahead and predicted travel times from point A to point B. Before they reach the closure itself, travelers will roll over another set of rumble strips. The end-of-queue warning system uses radar detection devices mounted ahead of work-zone lane closures to monitor and measure the speeds of approaching vehicles. The system analyzes data from multiple sensors and, as vehicles slow down, an algorithm triggers a message for display on portable message signs located a few miles upstream of the construction site. When a slowdown is detected, the message on the PCMSs will read "Slow Traffic – 3 miles," or "Stopped Traffic Ahead," warning motorists far enough in advance for them to be prepared to slow down or stop. When no queue is detected by the system, the PCMSs will display a more generic "Road Work Ahead" message. The system will only be used from 7 p.m. to 7 a.m. in areas where there are lane closures in work zones. The I-35 projects under construction are scheduled for completion in 2017. Look up crash test ratings and compare them across different makes and models. Stay on top of safety issues for vehicles they already own. Consumers can register their vehicles to be notified by NHTSA if a safety issue is discovered. The app also makes it simple to submit complaints to NHTSA regarding possible safety problems with a particular vehicle. Get driving directions to the nearest child seat inspection station and get assistance to properly install their car seats and boosters. Receive important news and information from NHTSA, as well as recall notices and push notices on their recorded vehicles. Users can scan in their VIN number and the app will push applicable recalls and other alerts for their specific vehicle model as soon as they are issued. The SaferCar app for iPhone and iPod Touch devices is free to the public on Apple's iTunes Store. Development is currently underway for a version compatible with Android devices. The app launch coincided with the release of the NHTSA Application Programming Interface (API) – a new way to provide these important safety data. The APIs will provide developers with better, more flexible access to the data for analysis and integration into creative, consumer-friendly web and mobile apps. NHTSA will also publish an online course to teach developers how to use the new APIs. Improving Safety on Local and Rural Roads, July 23, 2013. 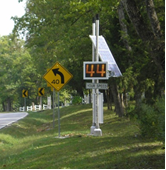 Join the FHWA Office of Safety for a webinar focused on low-cost technology to improve safety on local and rural roads. The discussion will address how to make the case for using ITS, what constitutes an ITS device or system, typical system components, and how ITS technologies can work alongside and add value to existing systems. This webinar, which will highlight the information provided in a soon-to-be-released guidebook called "Using Low-Cost Technology to Improve Safety on Local and Rural Roads," is designed for State DOT staff and local practitioners working to solve rural road safety issues and contractors involved in road construction. The webinar will also be of interest to county or local officials who want to learn more about the value of low-cost ITS solutions in addressing safety problems on the roadways within their jurisdictions. To register, please go to: https://www.nhi.fhwa.dot.gov/resources/webconference/web_conf_learner_reg.aspx?webconfid=26136 Questions? Need assistance registering? Contact Jennifer Symoun at jennifer.e.symoun@saic.com.